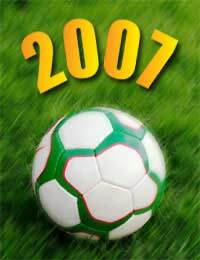 The 2007 FIFA Women's World Cup, held in September in China, saw some great football and record breaking results that did a lot for the women's sport in England and around the world. China were keen to host many sports competitions as possible in the run-up to the 2008 Olympics so that they could be well-prepared. The tournament had been scheduled to be held in China four years earlier but there an outbreak of the SARS virus caused it to be switched at the last moment to the USA. The curtain raising match saw one record go straight away. In demolishing the Argentineans 11-0 Germany registered the highest scoring result in Women's World Cup history. Despite being the holders of the Women's World Cup, Germany were seeded second to the USA, with Norway third and China, as the hosts, also seeded. Although second seeds, Germany were favourites from the start and duly took the title with some very controlled football, dropping only one point from all their matches, a 0-0 draw in their group match against England. England qualified from their group but were met by a strong USA team in the quarter-final. Although they managed to hold the Americans until just after half-time, England were then overpowered, the end result being 3-0. But the Americans themselves then faltered, running into a rampant Brazil playing scintillating football, and they lost their semi-final match 4-0. Norway and Germany played the other semi-final match, Germany swiftly despatching their rivals 3-0. Norway had headed a strong group, beating Canada in their opening match but then drawing 1-1 with Australia who finished group runners-up. In the quarter-final match a first-half goal had been enough to see off China, who had punched above their weight, using home advantage, with some excellent results. In the final match, Marta, the Brazilian star of their semi-final, had a penalty saved which would have equalised the Germans' opener. The Brazilians never recovered and a second goal just before the end of the match sealed the result. It was the first Women's World Cup Final that had been settled in 90 minutes. German goalkeeper Angerer's clean sheet was her sixth out of six matches and during the Final she also broke Italian Walter Zenga's outright World Cup record of 517 minutes without conceding a goal. She was elected to the Women's World Cup All Star team as was Marta, who collected the accolade of the Golden Ball for the best player, and the Golden Boot for scoring the most goals. These were scant disappointment for the result in the final though. England had played good football through their group but had made it harder than it had to be. In their first group match England were coasting at 2-0 up against the Japanese but let two free kicks in in the last ten minutes. Then came probably their best performance of their tournament, holding Germany to that draw. They followed up with a 6-1 drubbing of Argentina. In the end the dropped point in the match against Japan would not have mattered as England would still have been second to Germany on goal difference, meaning they would still have met the USA in the quarter-final match. England midfielder Kelly Smith was chosen for the Women's World Cup All Star team, a personal triumph for her. England's expedition to the Women's World Cup tournament, though ultimately disappointing, showed a lot of promise. After all, they hadn’t even qualified for the 2003 tournament. Hope Powell, the England Manager, praised the team and said that with more composure in front of goal they could have taken the USA in the quarter-final match. On, then, to the next FIFA Women's World Cup, to be hosted by Germany in 2011.